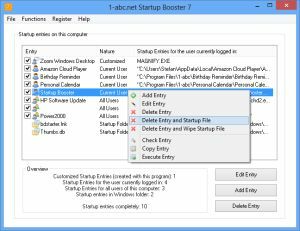 1-abc.net Startup Booster - ... so much more than just a Windows startup configuration tool! Much more than a Windows startup configuration tool! When Windows starts, it checks for registry entries that allow the system to execute files and programs together with it automatically. This so-called Windows startup can include drivers for printers and other hardware, anti virus software, anti spyware tools or programs that you want to use permanently. One problem is: viruses, spyware and adware often install such startup entries additionally that allow them to be started automatically every time you turn on your computer too. Another problem is that many programs do not delete their startup entries correctly when they are uninstalled. For that case, booting time is extended because the system searches for files that can not be found. 1-abc.net Startup Booster lets you configure all these startup entries very easy. Delete or add entries that you want to be started automatically with the system. And if you find out that you better should not have been deleted an entry, you can reverse your changes easily. But that is not all of course: When Windows was developed, no-one seemed to care about the fact that there could also be the need for automatically started programs one time per day, one time per week, every 10 minutes, all 5 days, every 20th of the month and so on. So besides a comfortable configuration tool for conventional startup entries 1-abc.net Startup Booster also allows you to add such customized entries. Just think about it: Would it not make sense to start your defragging program all two months? Would it not make sense to open your schedule for the week every Monday morning automatically? Would it not make sense to show you a picture of your family on Friday when it would be time to go home? 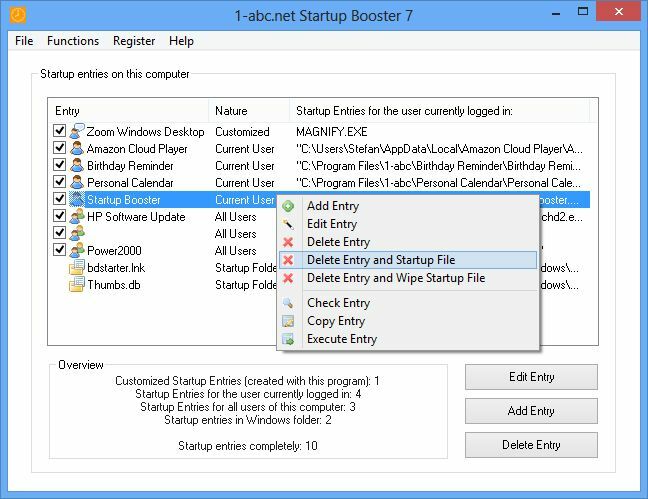 1-abc.net Startup Booster extends your Windows startup to an easy-to-use schedule for starting programs and files to any time you want!